Seems that Brown can feel the Hand of Destiny on his shoulder. Yup, it's all closing in on Gordon. I knew there was a joke in there somewhere. 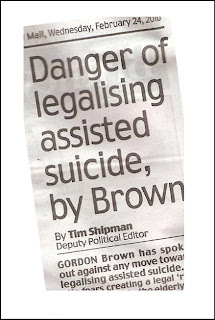 It appears that Gordon Brown would prefer to lead a mass suicide than be quietly bumped off.